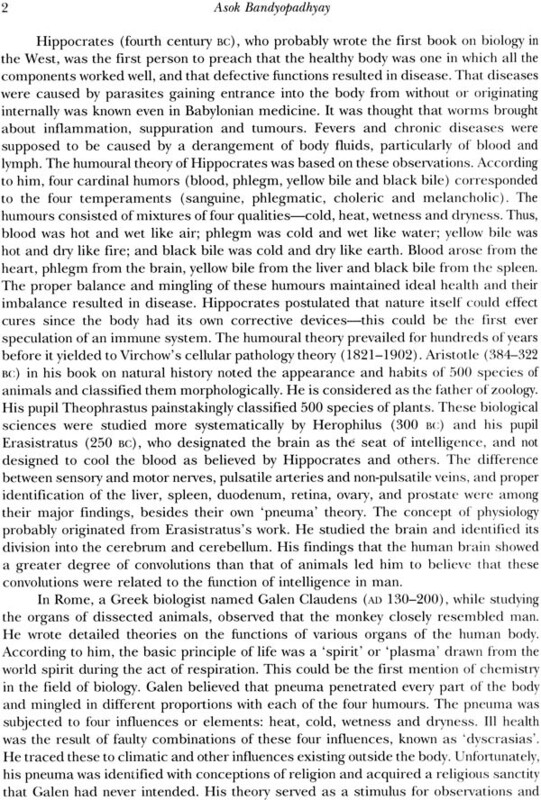 The study of the biochemical functions of living beings. Which dates back to at least the time of Hippocrates? Now touches all areas of the life sciences. The history of this study most familiar to the layman as well as the scientist is that of individual minds and great discoveries. 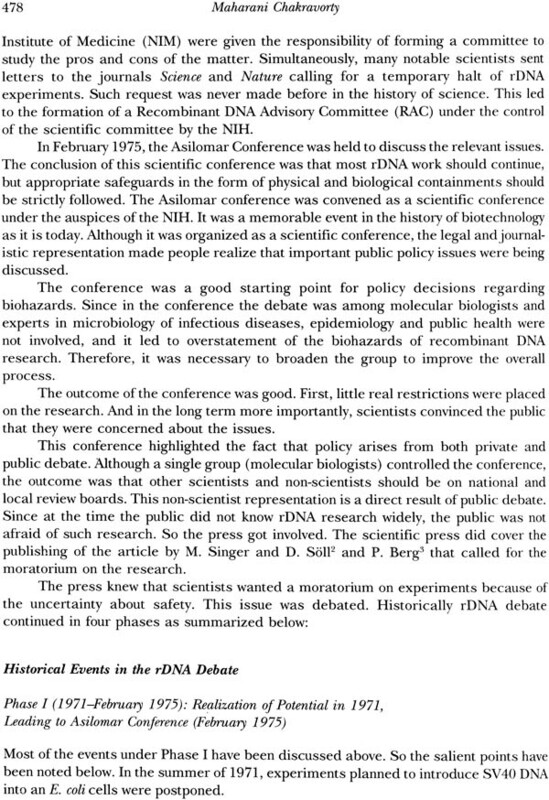 But how has the field of science we now call biochemistry emerged from its roots in physiology and chemistry as a distinct discipline, with a separate scientific community and body of established knowledge? How has the direction of its study been guided in the past, and what are its prospects for the future? 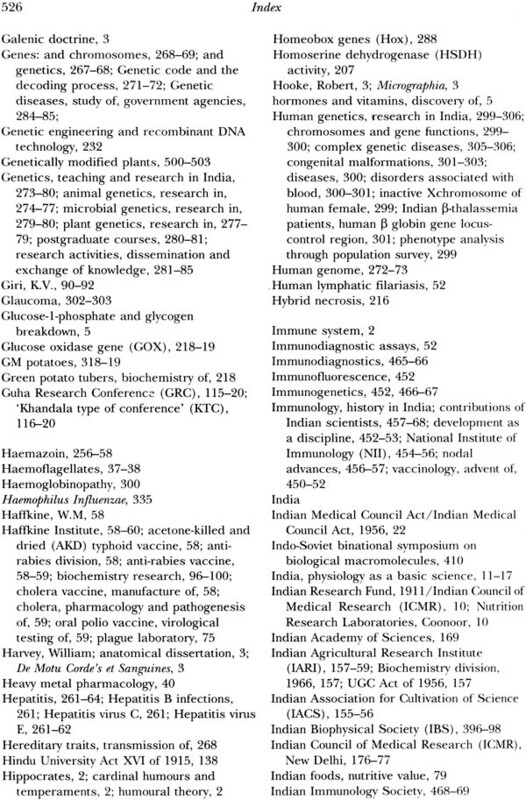 In this volume, 10 prominent scientists offer perspectives and insights from the fields of physiology, plant biology, microbiology, genetics, biophysics, molecular biology, immunology and biotechnology to answer these questions with regard to India. They examine not only the major discoveries, developments and research that shaped the direction of the discipline, but also the research groups and institutions that made them possible. This comprehensive analysis includes the role and influence of various funding agencies; the establishment of formal training programmers, university departments and research institutions; and the founding of professional societies for furthering the progress of various fields of research. 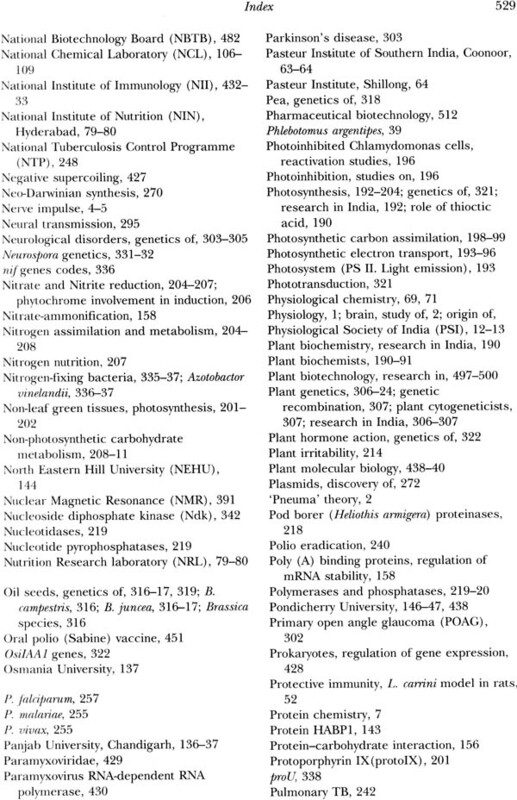 In the course of this study, the volume also considers issues such as the ethical implications of new developments in biotechnology, and the practical applications of research in agriculture, medicine, forensics, industry, etc. 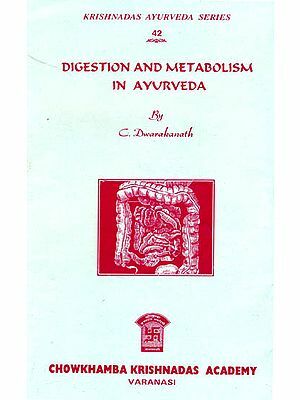 Reflecting the immense and varied scope of the subject, this exhaustive volume offers a prospect of a vast and evolving field with an increasingly influential and important presence in India—that will interest students, researchers and teachers of biology, chemistry and biochemistry, as well as those interested in the history of scientific developments in the country. D.P. Chattopadhyaya, MA LLB, PhD (Calcutta and London School of Economics), Dlitt (Honoris Causa) studied and researched on law, philosophy and history, and taught at various universities in India, Asia, Europe and the USA from 1954 to 1994. Founder Chairman of the Indian Council of Philosophical Research (198 1—I 990) and President-cumChairman of the Indian Institute of Advanced Study, Shimla (1984 1991), Chattopadhyaya is currently the Project Director of the Project of History of Indian Science, Philosophy and Culture (PHISPC) and Chairman of the Centre for Studies in Civilizations (CSC). 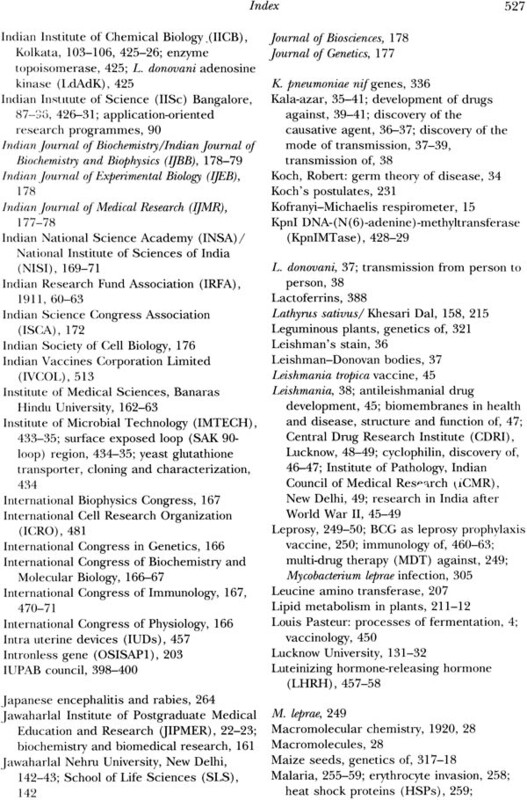 Among his 37 publications, of which he has authored 19 and edited or coedited 18, are Individuals and Societies (1967); Individuals and Worlds (1976); Sri Aurobindo and Karl Marx (1988); Anthropology and Historiograph of Science (1990); Induction, Probability and Skepticism (1991); Sociology, Ideology and Utopia (1997); Societies, Cultures and Ideologies (2000); Interdisciplinary Studies in Science, Sociqy, Value and Civilization Dialogue (2002); Philosophy of Science, Phenomenology and Other Essqys (2003); Philosophical Consciousness and Scientific Knowledge: Conceptual Linkages and Civiliational Background (2004); Se7J’ Sorcery and Science: Theoretical and Historical Perspectives (2004); Religion, Phi losophi and Science (2006); Aesthetic Theories and Forms in Indian Tradition (2008) and Love, Lfr and Death (2010). He has also held high public offices, namely, of Union cabinet minister and state governor. He is a life member of the Russian Academy of Sciences and a member of the International Institute of Philosophy, Paris. He was awarded the Padma Bhushan in 1998 and the Padma Vibhushan in 2009 by the Government of India. D.P. Burma was trained as a physical chemist but later moved to biological sciences. 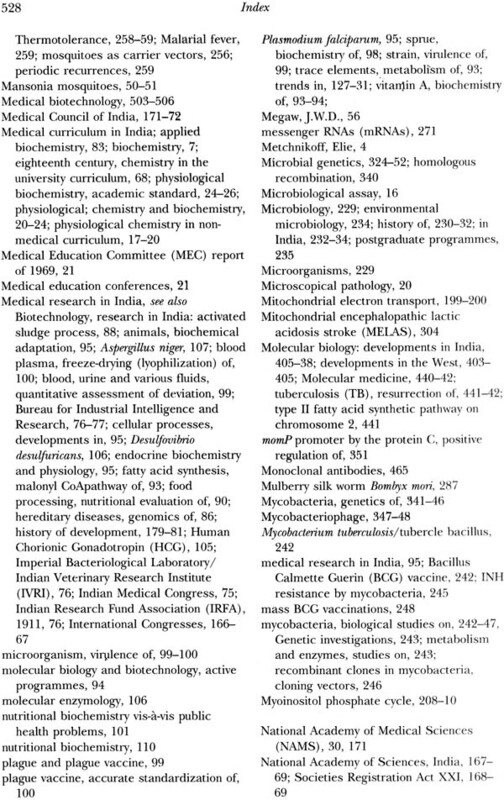 He received his training in biochemistry from stalwarts like R.H. Burr, B.L. Horecker and the Nobel Laureate Severo Ochoa. Initially he was associated with the Bose Institute and then the Department of Biochemistry, University College of Science, both at Kolkata. Finally he moved to the Institute of Medical Sciences, Banaras Hindu University (BHU), Varanasi. 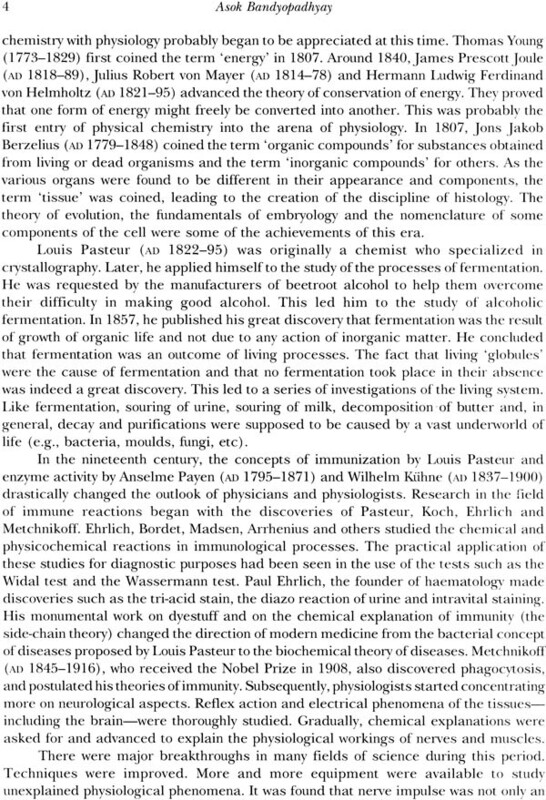 His major scientific contribution was in the area of protein synthesis. He and his wife, Professor Maharani Chakravorty, developed the molecular biology unit of BHU to an international level. 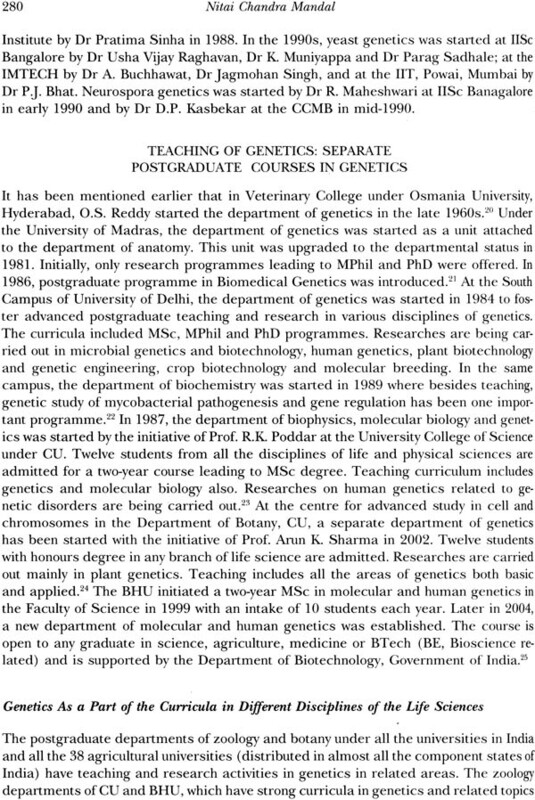 He is also the co-author, with Professor Maharani Chakravorty, of Music of Life: Development of Molecular Biology: A Personal Account. 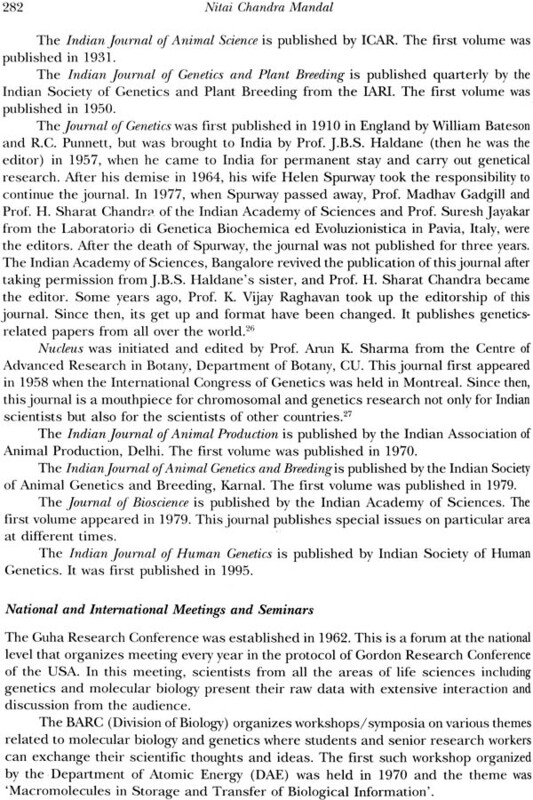 Maharani Chakravorty was trained as a plant physiologist but later moved to biochemistry. She earned her postdoctorate training in the laboratory of Professor B.L. Horecker at the School of Medicine at New York University. 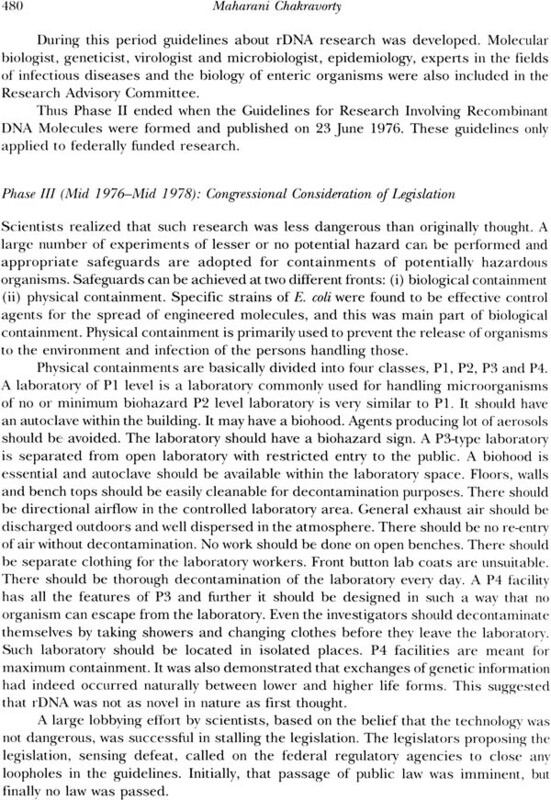 She had her formal training in bacterial genetics and bacterial viruses in Cold Spring Harbor Laboratory, USA. 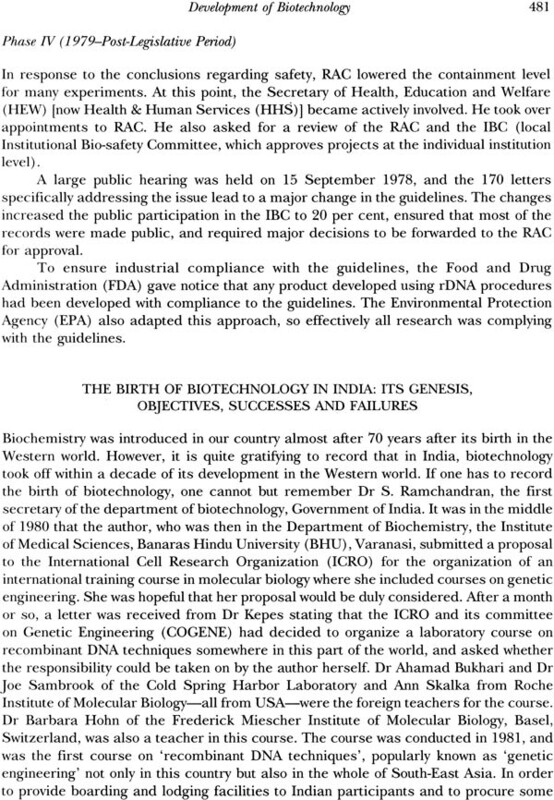 In 1967, she became the first Indian to be trained in the DNA—RNA hybridization technique at an International Cell Research Organization (ICRO)-organized course at Naples. Her major scientific contribution is in the field of host—virus interaction and genetic engineering. She served at the Banaras Hindu University in various capacities, including Professor and Head of the Molecular Biology Unit. After her superarmuation, she worked as Emeritus Scientist in the National Institute of Cholera and Enteric Diseases. Kolkata. It was in the middle of the year 2003 that Prof. DY. 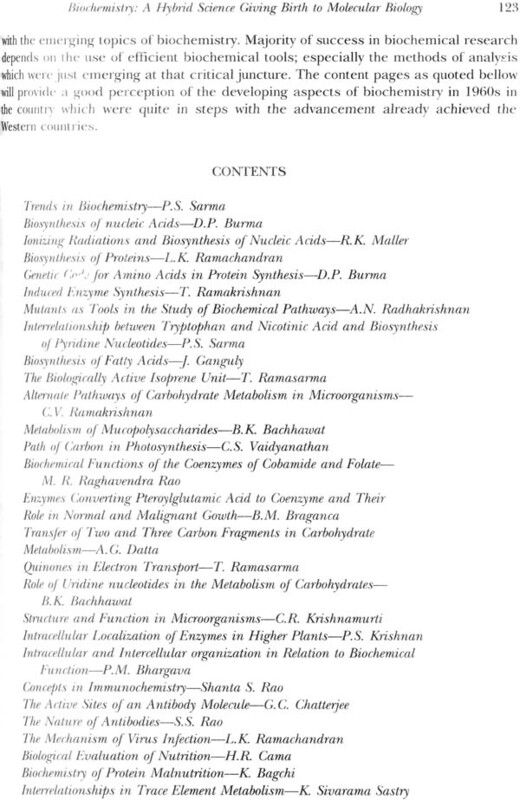 Burma received a phone call from 1)r PV, Subbarayappa, Honorary Director of the Centre for History and Philosophy of Science at the Indian Institute of World Culture, and Visiting Professor at the National Institute of Advanced Studies, Bangalore, asking whether Dr Burma would agree to edit a volume on the history of the development of biochemistry from physiology. Since Dr Burma was a legendary figure who witnessed the development of the subject in the country as well as in the Western world, he might have been Dr Subbarayappa’s natural choice for this noble cause. 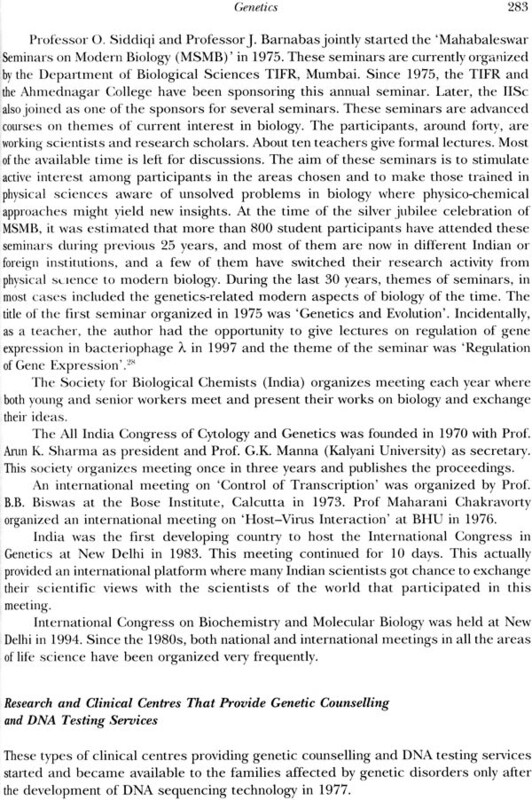 Dr Burma himself was a part of development of molecular biology, which he has documented in his book, Music of Lye: Development ofMolecularBiology: A PersonalAccount (2004), published by Vigyan Prasar, a DST organization. 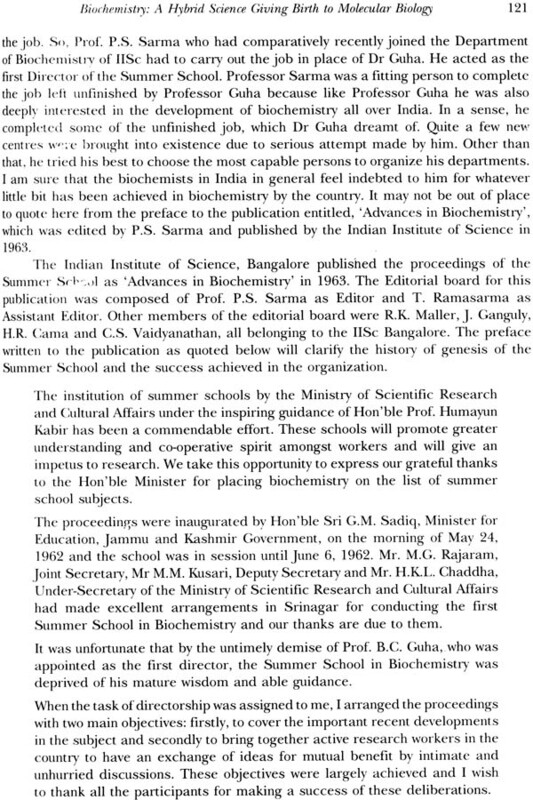 He was one of the three luminaries who helped biochemistry develop in our country. 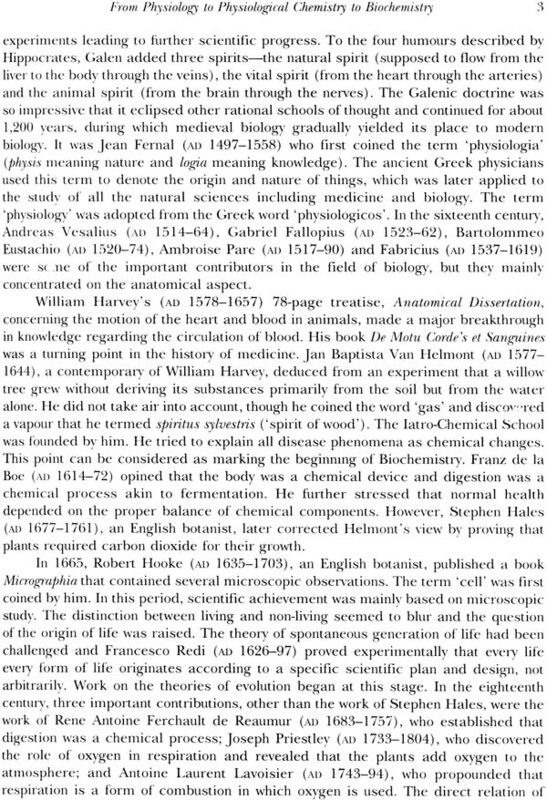 With his effort only was biochemistry recognized as an independent subject in the medical curriculum with status equal to that of physiology. He was a born teacher, a candle that consumes itself to light the way for others. He sacrificed his material comforts and embraced a life of hardship in pursuit of his mission. He used to say that students receive their lessons from a living teacher and not from textbooks alone, and encouraged a large number of students to scientific pursuits. To him the mind of a pupil is not a vessel to be filled, but a fire to be ignited. Despite the meager facilities available to him in the country, he managed to compete with the Western world. At that moment we were not very sure whether he should take up the assignment because of his age-related problems. At that juncture one PhD student of biochemistry—I don’t want to mention her name—came forward and assured Prof. Burma that she would help him in fulfilling the assignment. Although she was a PhD in biochemistry, her interest was in the history of science. 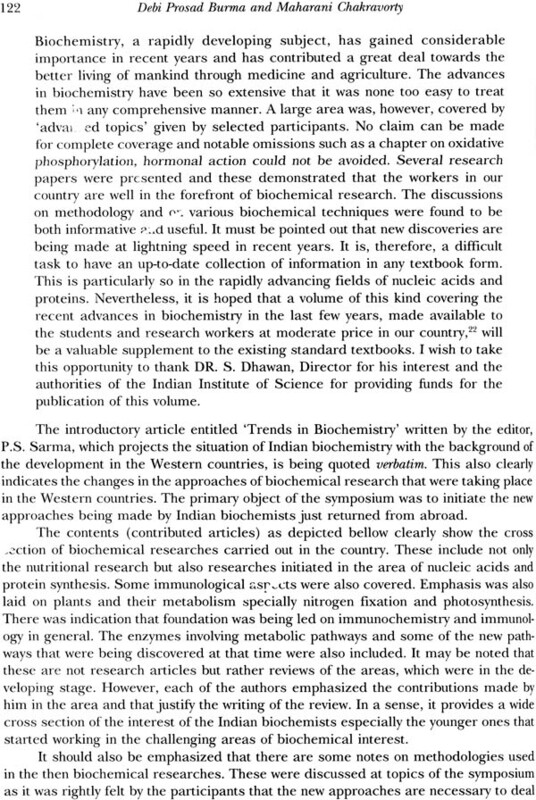 Dr Burma had helped her in the past on an article on ‘History of Biochemistry’. He had provided her materials as well as guidance. I thought that if she could act as a research associate in this project, it would not be too difficult for Professor Burma, as she could collect the relevant materials and reproduce Professor Burma’s dictations. I thought it would keep Professor Burma busy and happy, as he loved reading and writing. Moreover, he would not feel lonely, for I was then leaving for the National Institute of Cholera and Enteric Diseases for my own research work. So he accepted the offer to work for the project as Editorial Fellow. Unfortunately, the lady biochemist did not join the project as she was offered a better position (with better remuneration) from another organization for more or less a similar job. Since Dr Burma had already accepted the proposal, he did not want to back out, and I hoped that the ball would start to roll. Professor Burma collected a lot of information through mail. Because of his fatherly position in the field of biochemistry, everyone obliged him with the information he wanted. 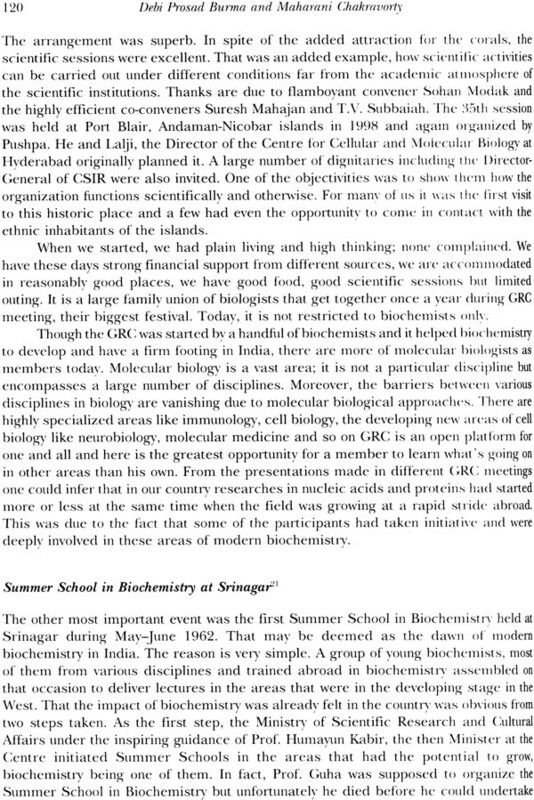 We decided that since biochemistry is a hybrid subject; and many related disciplines had helped biochemistry to grow and vice versa, it would be better if a few such subjects were selected and Indian contribution(s) in those areas were also documented. So we thought of the other chapters to be included in the volume. I write ‘we’ as I was unofficially very much involved in this work even then. Since I believe that our karma is our dharma and being in the same field and his sahadharmini as well it was my duty to help him in this endeavour as well. In April 2004, he attended the Editor’s Conclave Meeting at Delhi. He was not physically very well at that time. After coming back from Delhi, where he attended a few more scientific meetings, he became sick and had to be admitted in a nursing home. He recovered and came back home, and organized the ‘Contributor’s Conclave’ meeting, which was held in Kolkata in October. Between his stay in the nursing home and the meeting, he had to be admitted in another nursing home. After staying there for 23 days he recovered completely and returned home. He was, however, very restless about organizing the meeting in Kolkata, which he wanted to be perfect in all respects. It is nice to be a good teacher and to have a family of scientists. My niece, Dr Anindita Chakravorty, and one of Dr Burma’s students, Dr Sanjit Dey, took the whole responsibility of organizing the meeting. Professor Burma attended the meeting and even delivered his talk from a wheelchair. During that meeting there was a lot of discussion and feedback from local experts, and the contributors were requested to submit their first drafts as early as possible; within six months before we could hold a second such meeting. At home, lying on his bed, he used to dictate to an assistant. In the evening I used to go through it and make corrections as necessary. I expected work to progress this way and that he would be able to complete his assignment. However our destiny was quite different. His health started deteriorating, and more and more problems cropped up. On the fifth of December he was again admitted to a nursing home. In spite of my earnest hopes and the doctors ‘efforts he did not recover, but succumbed to his illness on 4 February 2005, exactly two months after his admissionto the nursing home. Before his journey to the last nursing home he perhaps realized that he might not be able to complete the job, so he often used to ask me to sit down and listen to the way he wanted his chapters to be written and how the volume was to be edited. I never listened to him; rather I used to get irritated, as I used to think that once I take up the responsibility he could leave this world peacefully. So my reply used to be, ‘I won’t take up the responsibility but will help you work.’ Unfortunately, I could not make him finish his assignment and he left this world before this work came to a stage of incompletion. Since he was not in a position to communicate, he could not advise me how he thought of writing his chapters and editing the volume. He collected a lot of material and put some of his thoughts in black and white. I did not want that his effort be should become fruitless. At that stage my grief-stricken heart induced me to take the responsibility of finishing the assignment, and I expressed my desire to Prof. D.P. Chattopadhyaya, Chairman, and Centre for Studies in Civilizations, who kindly agreed the proposal. Unfortunately, at that stage I did not realize the depth of the assignment. Unless one puts one’s feet in the water one does not know how deep the bottom is. I tried my best to do justice to the envisaged programmed of work. It is up to the readers to judge whether I am successful or not. I would like to dedicate this volume to Prof. Debi Prasad Burma with the hope that his efforts as Editorial Fellow of the project did not go to waste. It is understandable that man, shaped by Nature, would like to know Nature. The human ways of knowing Nature are evidently diverse, theoretical and practical, scientific and technological, artistic and spiritual. This diversity has, on scrutiny, been found to be neither exhaustive nor exclusive. The complexity of physical nature, life-world and, particularly, human mind is so enormous that it is futile to follow a single method for comprehending all the aspects of the world in which we are situated. One need not feel bewildered by the variety and complexity of the worldly phenomena. After all, both from traditional wisdom and our daily experience, we know that our own nature is not quite alien to the structure of the world. Positively speaking, the elements and forces that are out there in the world are also present in our body- mind complex, enabling us to adjust ourselves to our environment. Not only the natural conditions but also the social conditions of life have instructive similarities between them. This is not to underrate in any way the difference between the human ways of life all over the world. It is partly due to the variation in climatic conditions and partly due to the distinctness of production-related tradition, history and culture. Three broad approaches are discernible in the works on historiography of civilization, comprising science and technology, art and architecture, social sciences and institutions. Firstly, some writers are primarily interested in discovering the general laws which govern all civilizations spread over different continents. They tend to underplay what they call the noisy local events of the external world and peculiarities of different languages, literatures and histories. Their accent is on the unity of Nature, the unity of science and the unity of mankind. The second groups of writers, unlike the generalist or transcendentalist ones, attach primary importance to the distinctiveness of every culture. To these writers’ human freedom and creativity are extremely important and basic in character. Social institutions and the cultural articulations of human consciousness, they argue, are bound to be expressive of the concerned people’s consciousness. By implication they tend to reject concepts like archetypal consciousness, universal mind and providential history. There is a third group of writers who offer a composite picture of civilizations, drawing elements both from their local and common characteristics. Every culture has its local roots and peculiarities. At the same time, it is pointed out that due to demographic migration and immigration over the centuries an element of compositeness emerges almost in every culture. When, due to a natural calamity or political exigencies people move from one part of the world to another, they carry with them, among other things, their language, cultural inheritance and their ways of living. In the light of the above facts, it is not at all surprising that comparative anthropologists and philologists are intrigued by the striking similarity between different language families and the rites, rituals and myths of different peoples. Speculative philosophers of history, heavily relying on the findings of epigraphy, ethnography, archaeology and theology, try to show in very general terms that the particulars and universals of culture are ‘essentially’ or ‘secretly’ interrelated. The spiritual aspects of culture like dance and music, beliefs pertaining to life, death and duties, on analysis, are found to be mediated by the material forms of life like weather forecasting, food production, urbanization and invention of script. The transition from the oral culture to the written one was made possible because of the mastery of symbols and rules of measurement. Speech precedes grammar, poetry prosody. All these show how the ‘matters’ and ‘forms’ of life are so subtly interwoven. The PHISPC publications on History of Science, Philosophy and Culture in Indian Civilization, in spite of their unitary look, do recognize the differences between the areas of material civilization and those of ideational culture. It is not a work of a single author. Nor is it being executed by a group of thinkers and writers who are methodologically uniform or ideologically identical in their commitments. In conceiving the Project we have interacted with, and been influenced by, the writings and views of many Indian and non-Indian thinkers. The attempted unity of this Project lies in its aim and inspiration. 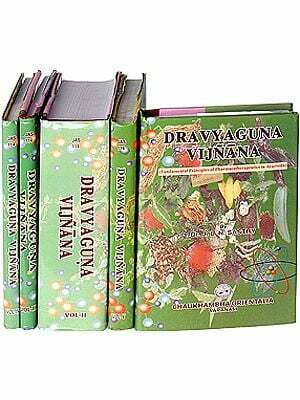 We have in India many scholarly works written by Indians on different aspects of our civilization and culture. Right from the pre-Christian era to our own time, India has drawn the attention of various countries of Asia, Europe and Africa. 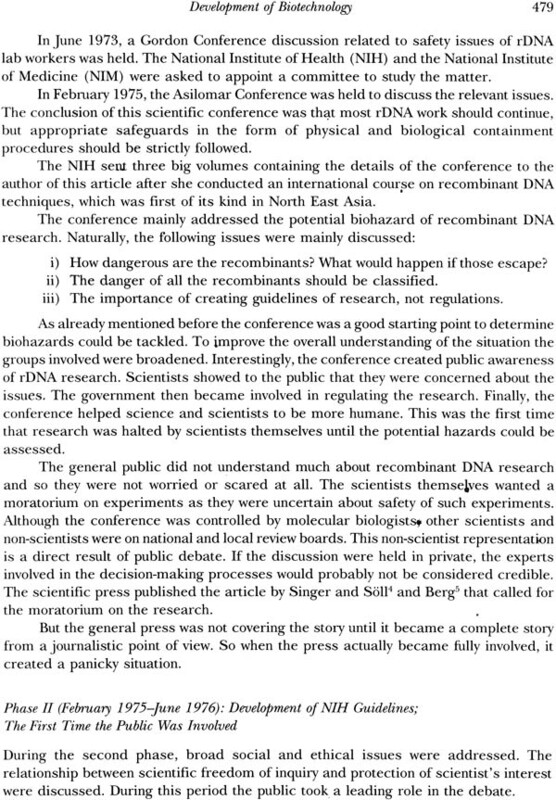 Some of these writings are objective and informative and many others are based on insufficient information and hearsay, and therefore not quite reliable, but they have their own value. Quality and view-points keep on changing not only because of the adequacy and inadequacy of evidence but also, and perhaps more so, because of the bias and prejudice, religious and political conviction, of the writers. Besides, it is to be remembered that history, like Nature, is not an open book to be read alike by all. The past is mainly enclosed and only partially disclosed. History is, therefore, partly objective or ‘real’ and largely a matter of construction. This is one of the reasons why some historians themselves think that it is a form of literature or art. However, it does not mean that historical construction is ‘anarchic’ and arbitrary. Certainly, imagination plays an important role in it. But its character is basically dependent upon the questions which the historian raises and wants to understand or answer in terms of the ideas and actions of human beings in the past ages. In a way, history, somewhat like the natural sciences, is engaged in answering questions and in exploring relationships of cause and effect between events and developments across time. While in the natural sciences, the scientist poses questions about nature in the form of hypotheses, expecting to elicit authoritative answers to such questions, the historian studies the past, partly for the sake of understanding it for its own sake and partly also for the light which the past throws upon the present, and the possibilities which it opens up for mounding the future. But the difference between the two ouches must not be lost sight of. The scientist is primarily interested in discovering is and framing theories, in terms of which different events and processes can be menaced and anticipated. His interest in the conditions or circumstances attending concerned events is secondary. Therefore, scientific laws turn out to be basically abstract and easily expressible in terms of mathematical language. In contrast, the historian’s main interest centers round the specific events, human ideas and actions, not coral laws. So, the historian, unlike the scientist, is obliged to pay primary attention to circumstances of the events he wants to study. Consequently, history, like most other -.monistic disciplines, is concrete and particularistic. This is not to deny the obvious cut those historical events and processes consisting of human ideas and actions show me trend or other and weave some pattern or another. If these trends and patterns ere not there at all in history, the study of history as a branch of knowledge would not I’ve been profitable or instructive. But one must recognize that historical trends and patterns, unlike scientific laws and theories, are not general or puqiorted to be universal us their scope.